White Water Rafting, Easy access, gateway to the other tourist destination, Mild River experience and beautiful natural surroundings. Trishuli River Rafting is one of the coolest and easier rivers to entertaining. The rapid of the river is mostly 2 to 3 grade, There are few good rapid such as Snail’s nose, Teendevi, Malekhu rapid, Monkey rapid, Upset, Surprise, Monsoon, Cotton Pony, Ladies Delight, S-Bend, Highway, Monsoon and Pinball Rapid. You can do the rafting from 3 hours (1 day) to 3 days so we can make your trip longer or shorter as your interest and time frame however one or two days is good enough for this river. You can easily add on your other tour or trekking plan as the river is following the Prithivi Highway so it is easy and nearer to access from Kathmandu, Pokhara, Chitwan National Park and so on. Trishuli river rafting is very famous for easy access and soft rapid. You can find the group any day of your time frame. 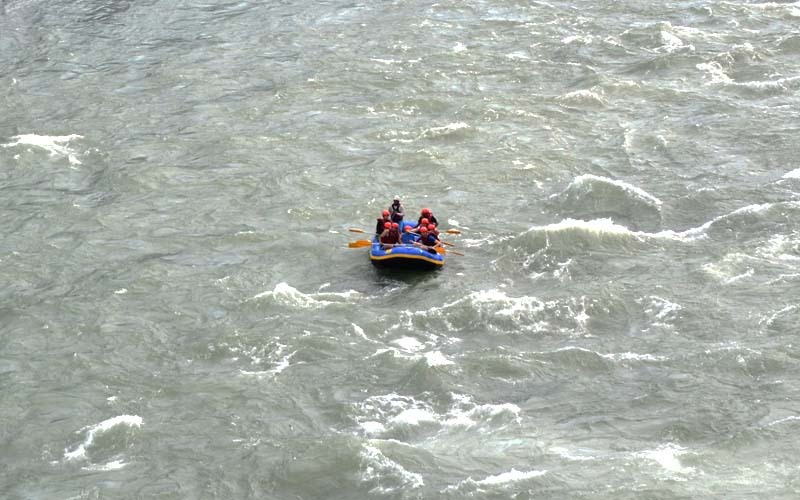 This river rafting is very useful for saving time and enjoys the beauty of river experience with great Scenic valleys and impressive gorges, Exciting Rapids. Day 02: Kurinighat to Simaltar. As soon as you get out into the Charaudi from Kathmandu or Pokhara or Chitwan or anywhere, our guide and staff will meet you in the roadside, Charaudi. You can reach here with 2.30 hours drive from Kathmandu, 2 Hours drive from Chitwan and 3 Hours drive from Pokhara. Once all of you geared up with rafting equipments your guide will make a meeting about the safety and tells you how to use paddles. There are few rapids with grade 1 to 3. After hour and half in the rafting you will reach into lunch spot. This is an outdoor lunch by the river. We will begin with a rapid Jhoolunge Pul which is named after a very old suspension bridge. There are few more to comes before you end up the day raft. (if you are doing 1 day rafting you will come catch a vehicle to your next destination). If you are doing rafting another day then you will be accommodate in the Resort by the riverside. Breakfast in the Resort and starting rafting in the morning. There are few bouncy rapids to be entrained with river water. Once you reach at Simaltal, we will serve the lunch and will be transfer to the vehicle to your next destination. Tailor-Made " Possible Every Day"